Saturday is as usual like any other weekdays. Today, mum at wok and uber on the road. Waking up my Aishah with a very patience gesture because she can be very cruel to those who woke her up. At one time, I did got her free kick! Whereas Nasuha, a touch of a finger can make her up and about. But, her bathroom affair takes up a lonnnngg time. Usually I will make her go to the bathroom first while I do other choas in the house. Not enough time for breakfast. Today my daughters have activities in school. Aishah, again as usual, a stop by Zakat Mart is sufficient enough. A packet of Chipsmore and a Milo will make her smile and eager to go to school. Her English Tuition class by Sir Siva is on every Saturday from 8.00 am to 10.00 am. Hopefully her english will be improving tremendously. A very good effort by the teachers to give extra class to ‘budak kampung’. Thank you teachers!! Came back to the house to fetch Nasuha. She also going to her school because she’ll be helping her teachers in the field. There are Bola Baling friendly matchers between schools in Seberang Perai Tengah. We had our breakfast in the FF restaurant in Sg Dua. Too early and we were the first customer. 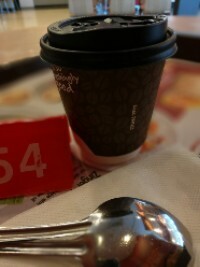 Had our hot Milo first while waiting for chicken porriage to be serve. After sending her in, I stayed awhile in the car. Mark a few exercises books and my eyes started to drift zzzzz. I remembered, onions and garlic is null in my kitchen. Nearby is Market Sg. Dua. Walked there and bought those things including Chicken Meat and Tapai Pulut. I just love Tapai Pulut. On the way, I stopped at Kedai Ikhwan to buy Fried Chicken for Amir. Lunch…. got a craving for nasi lemak. Just bought anchovies, fresh from Tanjung Dawai. So, decided to have nasi lemak for lunch! 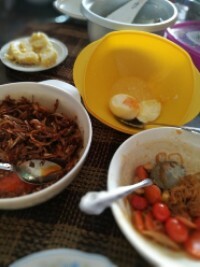 My children asked for Sambal Ikan Bilis, Boiled eggs and mix vegetables. Done eating!! Afternoon, spent lazying around the house, playing with the kittens and watching TV. Amir with his kebun around the house. Sangat rajin budak ni, said my mum. 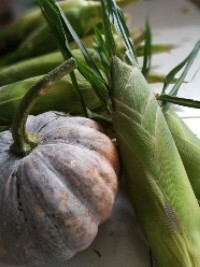 Yesterday he brought back these from his kebun…pumpkin and sweet corn. Ermm… nak masak apa ya? ?